Alanna Sousa is a social intrapreneur and global citizen. Passionate about social (intra)entrepreneurship, innovation and youth leadership development, Sousa has spent the last six years working in the nonprofit sector. She earned a bachelor’s degree in law from CESUSC in Florianopolis, Brazil, and a postgraduate certificate in social innovation management from the Amani Institute, in Nairobi, Kenya. Originally from Brazil, Sousa has taught English to children with HIV in India, studied different approaches to justice and conflict resolution in Canada, applied restorative justice in Mozambique and brought light to the lives of people living in the slums of Brazil and Kenya. Sousa is dedicated to making the world a better place through business and is currently the program manager at the Global Good Fund. Six years ago, Alanna Sousa couldn't even pronounce the word 'entrepreneurship,' but she soon fell in love with social entrepreneurship. 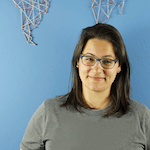 Sousa recounts her journey from naively opening a 'consultancy for social impact' in her native Brazil to learning the importance of mentoring and coaching for success in the social business sector. She now works for the Global Good Fund, which trains young entrepreneurs to tackle urgent social problems.